Fall is knocking on our doors with the promise of cooler evenings! The scent of the Aloysia Virgata “Sweet Almond tree” and the Osmanthus frangrans “Sweet Olive” are once again in the air. Our Sasanqua Camellias and Senna “Butter & Cream” are exploding with buds and blooms! Paperwhite bulbs are sprouting and White Heliotropes are starting to bloom. Succulents: Some of our favorites with “showy foliage” are; Aloe “Bright Ember” and Echeveria — both “Afterglow”& “Perle Von Nurenberg”. Fruit trees: It’s the perfect time in Pasadena to plant fruit trees! Donut Peach, Japanese Plum or an Avocado are all great choices. Fertilize: It’s time to fertilize your fruit trees. We’ve had a bumper crop of figs & guavas ripening this fall as a result of good fertilizing habits. Time to trim: As the cooler days begin it’s time to trim your California Native plants. If the summer heat was just too much for some, now is the time to replace them. We stock a good selection of Ceanothus, Manzanitas and Salvias during the month of November. Don’t forget to start cutting back or combing those beautiful ornamental grasses. Lately I have been inspired by the rose garden at the Huntington Gardens. There you will see a lavender tree-rose named “Love Song” that takes your breath away! It is surrounded by a bed of Serenita angelonias – giving a “preview” of what is possible for your garden next spring. Roses from all over the world are shown in the most sophisticated fashion. Amazing all who stroll under the arbors that Henry Huntington dearly loved! 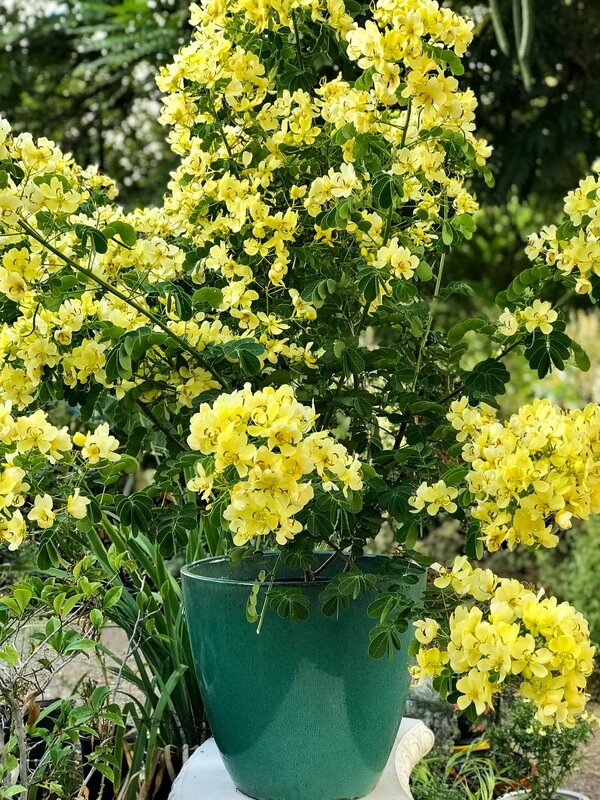 Plant of the Month: Senna “Butter & Cream” is in all it’s glory at this time of the year! Overflowing with beautiful yellow flowers that have a light fragrance. Considered a shrub or small tree, this evergreen can get between 8-10ft tall and wide. It likes the sun and will attract butterflies, bees and birds. Butter & Cream will make a stunning focal point in your yard at this time every year! The best season to plant in Southern California is Fall. It has been the gardener’s secret for generations in Pasadena. Our warm days are ideal for root growth and the cooler evening temperatures help plants retain moisture. Our last hot days in September are coming to an appreciated end. We recommend the Cole family of broccoli, cauliflower and kale. From seed or small starters; China peas, beets, onions, carrots and spinach. More of our favorite fall veggies include; sweet watermelon radishes, daikon sprouts and edamame beans. Cilantro and Dill are best planted in cool weather. Garlic chives and Wild Arugula are excellent and the maintenance is easy. Plant lavenders of all varieties! From French traditional to English and Spanish! Try some of our very own California adaptable versions of “Goodwin Creek” and “Multifida.” They love full sun and open/airy locations. I prefer to plant lavenders in front yards to show them off! Poppies, Baby Blue Eyes and Lupines. Brightly colored perennial flowers such as Lantana serve multiple purposes. They attract bees and butterflies, plus a splash of color to the garden! Gives you spectacular color and that much needed erosion control! Sow wildflower mixes and water-wise flower seeds! You cannot match the blooming spectacle of the Japanese Anemones or the Tiger Eye Abutilon bush! The bright orange fruit of a Japanese Persimmon or the last Pumpkin hanging on the vine. Plant those Coral Bells, Saxifragias and Bronze Phormiums you’ve been promising yourself. Seeing the beauty in the red leaves of dryopteris Autumn Ferns or Chinese Pistachios surely tells one it is Fall! The dog days of summer are upon us so let’s make the most of it! Stressed plants? If you have a lot of stressed plants in your garden the best cure is to apply generous amounts of liquid organic and fast acting fertilizers. We suggest “FoxFarm” microbrewed fertilizers. Starting with Bush Doctor’s “Wholly Mackerel” fish fertilizer and “Kelp Me Kelp You” made from seaweed. These are great for your citrus and guavas too! Watch out for HUNGRY insects! Rose thrips, mites and aphids are raising cane! We’ve noticed the beginning signs: curling of leaves, discoloration, sparse growth and later sooty mold or flower buds dropping off. Examine your Roses, Gardenias and Fuchsias. Treat with All Seasons Oil spray. Fall vegetables: Are you looking forward to planting your fall veggies? Our typical planting season begins in late August and goes through the end of October. If you were disappointed with your summer crops and want to get a head start on fall, it’s time to prepare your beds with G&B “Raised Bed Mix.” Are you container growing? Try our FoxFarms “Strawberry Fields” potting mix. Have you ever tried Winter Tomatoes or Purple Cauliflower? Or start from seed Botanical Interest’s lettuce mix and Super Sugar Snap Peas — our favorites! Summer weeds? Crabgrass, spotted spurge, purslane (yes, edible weed). Hoe them out! They’re robbing your plants of water and nutrients. Then cover with your choice of bark or corn gluten pellets to prevent more weeds from emerging. The fragrance & flavor of lemon. This fast growing perennial herb shrub gets between 6 and 8 feet tall, likes the sun & the heat, well drained soil and is a low water plant once established. It has blooms of small white to pale purple flowers in summer to fall. Its leaves are often used in teas, salads, fruit salads, pestos or as seasoning on meat dishes. They can also be dried and used in pot –pourri, retaining their fragrance for years. Plant it near your doors and windows and it will act as a “natural repellant” for mosquitoes and flies! Groundcover: It’s a great time to fill in those bare areas with some beautiful ground covers! Creeping Thyme, Santa Barbara Daisies or Trailing Rosemary are perfect for the job! Edibles: Planting edibles is all the rage these days! Join the fun with these winter herbs: Dill, Basil, Rosemary, English & French Thyme and Purple Sage. Easy winter vegetables: Artichokes, Carrots, China Peas and our favorite – Striped Beets! Fruit Trees: It’s a great time to plant fruit trees! We have a wonderful selection of plums, nectarines, peaches, apricots, pomegranates, guavas and avocados too! Irrigation: We may be watering all winter long. Now is a good time to check your irrigation systems. Drippers may need unclogging and sprayers need adjustments. Winter Rye: It’s easy to over-seed your lawn with winter rye: just sprinkle and water! A small amount of water twice a week will keep you and your lawn happy. Spring Sweet Peas: Don’t forget to plant your sweet peas now for cut flowers in the spring. Your florist doesn’t sell these! Plant of the month: Peppermint Tree “Agonis flexuosa” is a native of Western Australia. This fast growing, evergreen tree will get 25–35 ft tall. The leaves have a wonderful peppermint scent and spring will bring beautiful white flowers. It loves the sun and once established is fairly drought tolerant. • Protect soft skin fruit: peaches, apricots & nectarines from pesky critters. Wrapping your tree with netting allows sun and air in while making it harder for the critters to get your fruit. • Ants love summer weather: They farm aphids, scale, mealy bugs & other insects. Use Earth-tone Insect Killer or child and pet safe Dr. Earth Final Stop. Apply only to trails or nesting areas. • Prevent spider mite infestations: Spray roses, camellias & citrus with All Season’s Horticultural Oil or Safer’s Insecticidal Soap. Apply in the early morning before the sun is up to minimize over-spraying on our friendly bees. • Summer vegetables: There’s still time to plant; corn, beets, onions, squash, & modern tomatoes. Hybrids such as Better Boy, Early Girl & Sungold Cherry are heat tolerant, disease resistant and tasty!! • Protect your skin from the sun: Most gardeners -- including myself -- forget to do this. Wear a hat & sunscreen while working in your yard. • Plant fruit trees for shade & produce. We have: avocados, apples, figs, guavas & peaches. • Pull weeds - they take water away from your shrubs & trees. Use a swivel hoe to cultivate simultaneously. Top dress with organic compost. 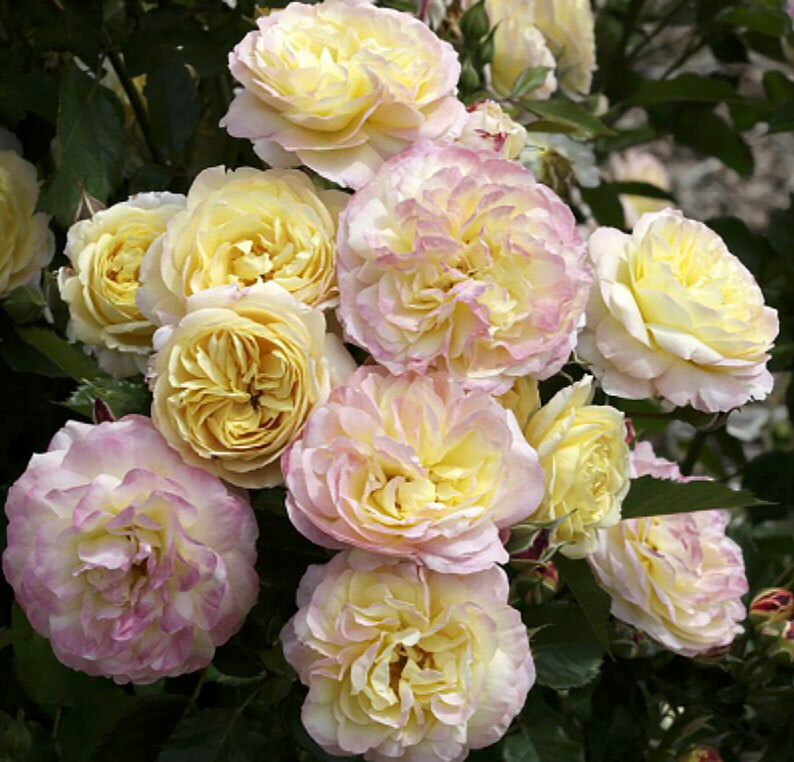 • Continue deadheading roses & treat for mildew or rust if needed. Spray with neem oil or Safer's fungicide. Feed every 4 weeks with G&B organic rose 4-6-2 to keep them flourishing. • Prune & feed camellias with G&B 4-5-2. • Plant corn, squash tomatoes & basil. Longer days will bring nice harvests to the table. • Fertilize your lawn for stronger drought tolerance. Use Growpower all purpose 5-3-1 or your favorite lawn food.